This is a question that we are often asked. The short answer is that it depends on the LED light fitting itself. Constant voltage LED drivers are often used to power LED strips. There are two common architectures used in the manufacturing of LED strip. Most low cost LED strip is manufactured using a simple constant voltage architecture, as shown in the diagram below. Although it has a low level of complexity and is a low cost solution, it has poor current regulation and low efficiency. Good quality LED strips are usually manufactured using an architecture that incorporates a built in driver IC, which gives a constant current output to each string of LEDs. This next diagram shows this type of architecture. 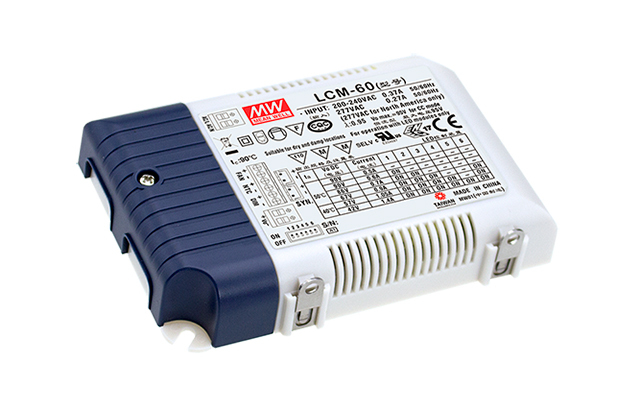 These driver ICs require a constant voltage power supply. This design gives more accurate control over each string and single LED failure can be easily controlled. This is why the cost of LED strip can vary greatly. 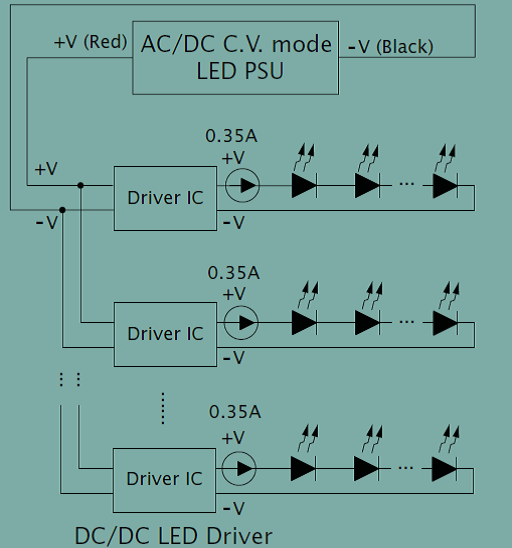 Constant current LED drivers are normally used with LED light fittings that have been manufactured by using the ‘direct drive’ driving method (shown in this diagram). This is where the current output of the LED driver directly powers the LED circuit. The ‘direct drive’ method has a low level of complexity, and a high level of efficiency. It is a low cost architecture, but it is prone to current imbalance. Therefore, it requires a high level of engineering knowledge to design a good quality light fitting. This is probably why it is most commonly used to drive LED downlights, where there is usually only a very small number of LEDs used in the design. So, as you can see before you can select an appropriate LED driver you need to know which type the LED light fittings (or LED strip) requires. Only the manufacturer of the LED strip or light fittings can tell you this. In some cases they may recommend a brand and model number of an LED driver you should use. Be warned, that if this is the case you will need to confirm that the LED driver specified is available in Australia with Australian electrical safety approvals. We are often contacted by customers, who have had an overseas LED manufacturer specify a Mean Well LED driver, which is not approved for use in Australia. Don’t worry if this has happened to you. In most cases Power Supplies Australia will be able to offer you a suitable alternative Mean Well LED driver from stock, which has Australian approvals. 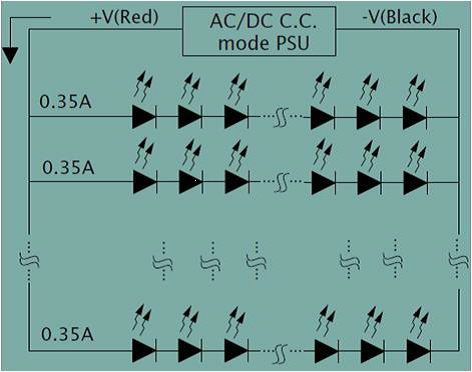 So how do constant current and constant voltage LED drivers differ? Well it is quite simple really. LED light fittings and strip that have been designed using the ‘direct drive’ method mentioned above require the output current to remain constant at the specified level at all times. There are often spikes in the incoming AC power supply at your wall socket. If the incoming AC supply does vary, a constant current LED driver allows the voltage to ‘float’ in order to maintain a constant current output. Constant voltage LED drivers do the opposite. They allow the current to ‘float’ in order to maintain a constant voltage. 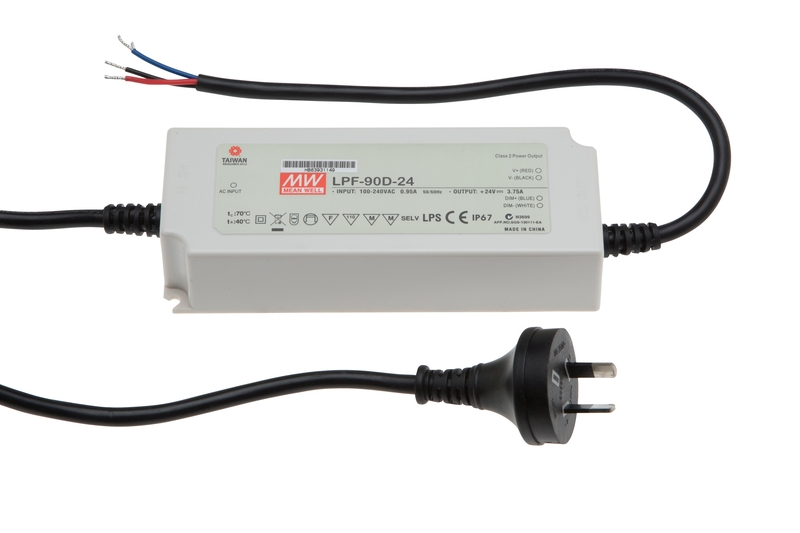 Do not hesitate to contact Power Supplies Australia, should you need any assistance in selecting a suitable LED driver. For further information please use the ‘Contact’ link above.